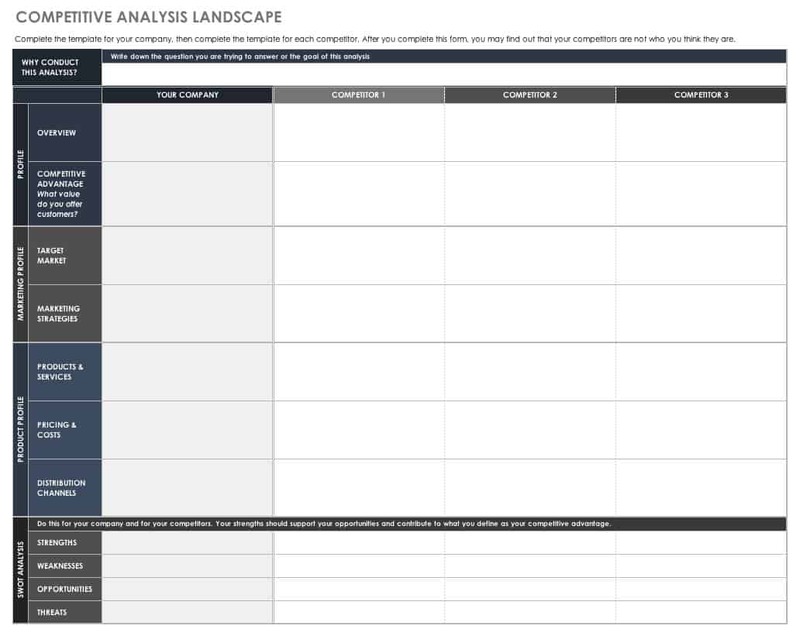 When engaging in competitive analysis, you can use a template to consider and capture details of the marketing landscape in which your business exists in order to improve your marketing decisions. More importantly, these templates help you focus on gathering information on your competitive landscape and deducing business lessons from that data, rather than mulling over which factors you should study. In this article, we cover what competitive analysis is, what a competitive analysis template should include, and where to look for information in your analysis. We also offer free, downloadable templates in Microsoft Word, Excel, PowerPoint, and Google Docs formats — all of these templates are customizable so you can include the particular information that’s relevant to your organization and analysis exercise. Find templates for the web, social media, small and general business analysis, and the presentation of your findings. Competitive analysis (CA) — sometimes called competitor analysis — is a vital process to help businesses stay on the cutting edge and anticipate market changes that they can use to their advantage. Competitive analyses, which should be conducted periodically, can help you strategize and plan for company growth by discovering opportunities and threats. From a media strategy perspective, the analysis of competitor collateral is essential for launching effective SEO-driven campaigns. SEO analysis reveals what keywords and approaches work, both for you and your competitors, and which campaigns should receive focus. Analyses also offer you a view into your company’s position in the competitive landscape. Although in the context of marketing, the word “competitive” suggests focus on “the other” (i.e., the rival), many marketing gurus believe that the heart of any marketing activity begins with the customer. An analysis of competitors helps you to better serve customers. By understanding what customers think competitors do well, you can craft a value proposition for your own company that allows you to shine in the marketplace. Competitive analysis puts a spotlight on the strengths and weaknesses of competing organizations as well as your own. A detailed review helps uncover potential opportunities. Most significantly, though, you must actually use the collected data in your new campaign to reap the benefits. Otherwise, competitive analysis is just an exercise. 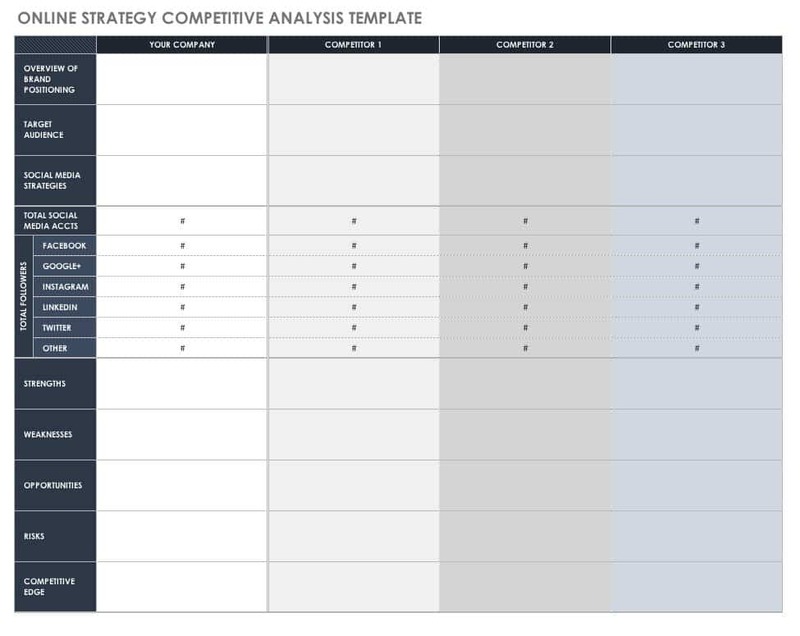 A competitive analysis template helps ensure that you store captured information. It can also ensure that analysis is consistent from year to year. 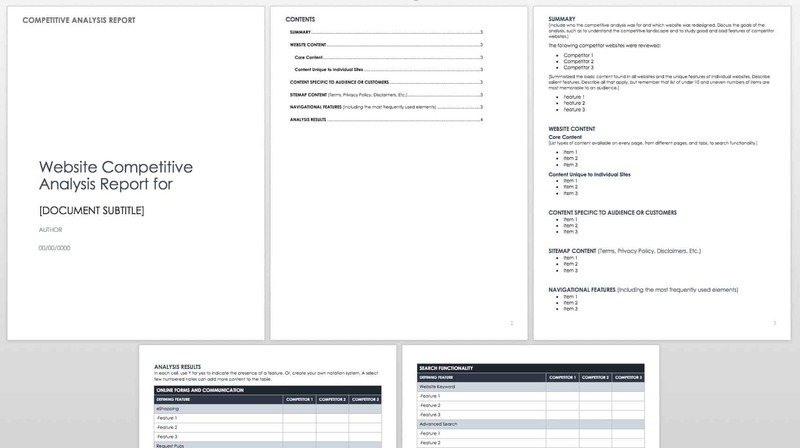 Above all, using a template guarantees that your primary efforts are put toward gathering and evaluating information, not into deciding what criteria to study and how to format notes. The overview and profile provide general information about your company and its competitors. Profiled competitors are usually direct competitors: those who offer a comparable product or service in the same area. A review of indirect competitors (those who offer a slightly different product or service that could substitute for yours) provides clues to potential direct competition or new opportunities for your business. Background information on a competitor may include the location of their head office, the number of employees, recent acquisitions, Securities and Exchange Commission (SEC) filings, and the names of key staff members. This section also includes the company’s mission statement, slogan, tagline, and main value proposition. The product and service portion of this section describes the products and services offered. Pricing details include list prices for key products and services. Distribution channel details include information about affiliates, retailers, and wholesalers. The target market (personas) area of this section looks at collateral and social media to determine the competitor’s target audience. You can combine this information into customer personas. Target audience information prepares you for when customers leave your competitors. Reviewing online presence is key today. Note all of your competitors’ social media channels and web pages. Also, document any other web pages where competitors are referenced. Understanding the context of social media channels can help you grasp the essence of a target market. For example, LinkedIn is aimed at professionals. Consider the brand messaging and tone on social media. Cultivate your company’s own voice. Market share is expressed as a percentage of the business that the company owns. Some marketing specialists think that knowing competitor market share is unnecessary. They believe you should focus on your own market share. SWOT stands for strengths, weaknesses, opportunities, and threats. Perform a SWOT analysis to identify what competitors are doing right, and what customers are complaining about. Also, you can assess how well a competitor is achieving their goals based on their apparent positioning. Use a competitor’s weaknesses to understand how you can fill gaps to make their customers your customers. Competitive advantage boils down to why a customer likes them better. In other words, what’s unique about the product or service that draws customers? Google: Search with pertinent keywords. LinkedIn: This site offers information on company size, locations, hiring, and key personnel. Yahoo Finance: Check this for financial background on organizations. AngelList: This resource lists startups, investors, and job openings at startups. Crunchbase: This outlines new products and companies and their investments. Alexa, SimilarWeb, and Other Online Tools: Use web search tools to find the traffic on keywords, backlinks, and more. Hoover and Manta: Find organization financial and structural information. SEC Filings: Peruse SEC corporate filings for key information about a company’s financial endeavors and financial health. Purchased Data: Buy database collections of consumer and corporate data. Website, YouTube, and Facebook Comments: Discover what users and customers really think about your products and services as well as those of your competitors. Brick-and-mortar establishments may be different from online competition. Backlinks are pages that link to other businesses’ pages, but not yours. Backlink analysis helps you gain links to your page from important sites. Keyword gap analysis highlights keywords you don’t currently have on your site that rank well for other competitors. Consider the brand story, and note which social media channels the site supports. Keep in mind that your actual product or service competitors may differ from your SEO competitors because of paid ads. It’s possible that the brick-and-mortar competitor is less important than the online competitor. For SEO research, survey domain authority, the keywords that attract traffic, and the amount of traffic for each of those keywords. If you are reviewing websites to understand usability and structure, you want to know what content sites have in common, what content is unique and interesting, and what common navigational features appear. Use this report to capture features of competitor websites, or adapt it to perform competitive analyses on other aspects of businesses.This template proves space to record details of search functionality and any other pertinent features. To study social media strategy, you want a template that allows you to look for all the social media channels you and your competitors are engaged with. This template also helps you see how many followers each competitor garners, and prompts you to consider who the product target market includes and what the product branding entails. When creating a competitive analysis for your small business, you want to conduct a thorough review of all facets of marketing. Start by determining who your competitors are, what you think you already know about them, and what you know about your own business. Next, describe target markets, products and pricing, media strategies, and perform a SWOT analysis. In addition to the usual queries about business factors, you may also want a template that reminds you why you are conducting the analysis. 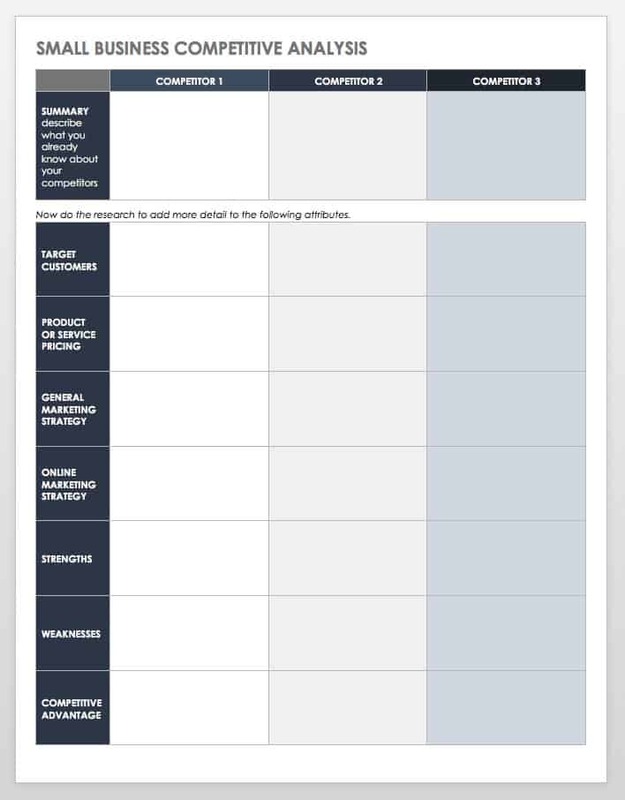 Complete this template for your own company and then for your competitors. By grading competitors on value proposition, content strategy, and funnel efficiency, you can derive an idea of how successful companies are in their marketing strategies. Use Excel formulas and your scores will automatically total and appear on a heat graph. Define Your Target Audience for the Analysis Presentation: You can also create multiple presentations aimed at different audiences, such as a summary for executives and a PowerPoint for marketing, sales, and development. Add Each Competitor’s Logo: This helps to differentiate among companies in the document and can convey significant information about each brand. Show the Product: If you can, add images of the competitor’s products or images that convey the nature of their services. Use High-Resolution Graphics: They heighten impact. Consider the Company Description: Include the tagline, slogan, mission statement, and value proposition. In addition, discuss how companies position and describe themselves. Keep Information Consistent: All competitors should be described with the same type of information and level of detail to avoid bias. Look at the Good They Do: When reviewing competitor strengths and weaknesses, don’t just consider the weaknesses; think about what makes their customers happy. 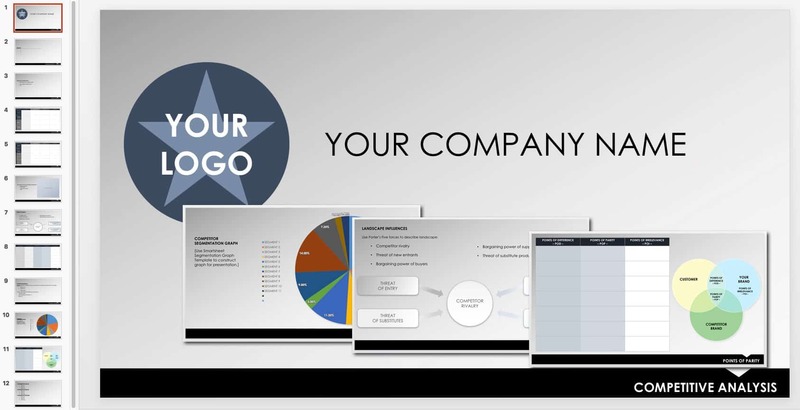 Try the following PowerPoint template for company presentations. 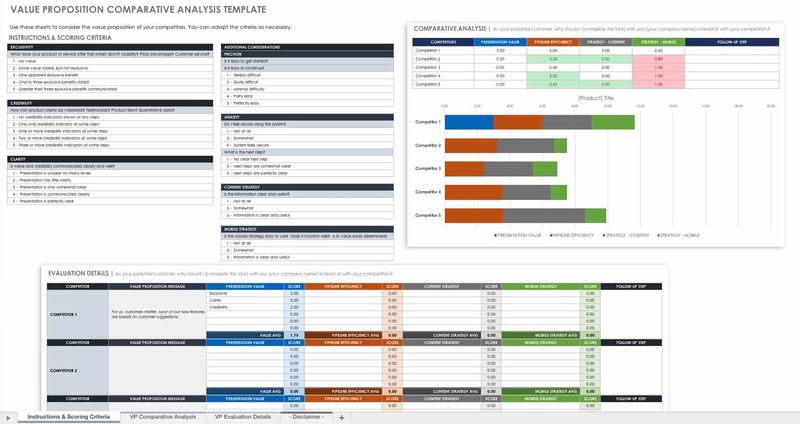 The template provides tips for explaining the purpose of an analysis to non-marketing team members and leaves room to discuss factors in the competitive landscape, environmental pressures, and much more. Mastering the complexity of competitive analysis is crucial to improving marketing decisions and getting and staying ahead of your competitors. To ensure that you get the most out of your competitive analyses, consider using an automated software tool to stay organized. Smartsheet is an enterprise work management platform that is fundamentally changing the way businesses and teams work. Over 70,000 brands and millions of information workers trust Smartsheet to help them accelerate business execution and address the volume and velocity of today's collaborative work. Discover how Smartsheet can help maximize your competitive analysis efforts today.